"Worlds smallest APRS transceiver" offers many applications. Matchbox-sized, built in GPS receiver. The transceiver can not only be used as APRS tracker, but also as receiver for APRS data. The graphical OLED display (128x64 pixel) shows received APRS position reports, APRS messages and status information. When receiving position reports the distance and direction to the sender is shown. The own GPS coordinates are also shown, allowing the Mini APRS Trasmceiver to be used as a GPS redceiver as well, for example for Geo Caching. The built in 850mAh LiIon battery allows operation of approx 10 hours. The HF receiver can be deactivated to save power, the device then functions as a pure GPS tracker. To extend battery lifetime even further the GPS receiver can be turned on and off in programmable intervals. The built in micro USB conenctor is not only used to charge the built-in battery, but also for upgrading the firmware and to communicate with the main processor. This opens the road to further development of the Mini APRS transceiver, for example as a GPS mouse for the computer. More applications are under development. The transmitter utilzes a 7-pole low pass filter to suppress unwanted harmonics. The main processor is well known from the Arduino world, it's an ATmega 1284p. The current software uses less than one third of the available memory, this allows for a lot of further developments in the future. The tiny size of just 30 x 56 x 22mm is close to that of a matchbox. The weight (without antenna) is just 45 gram. 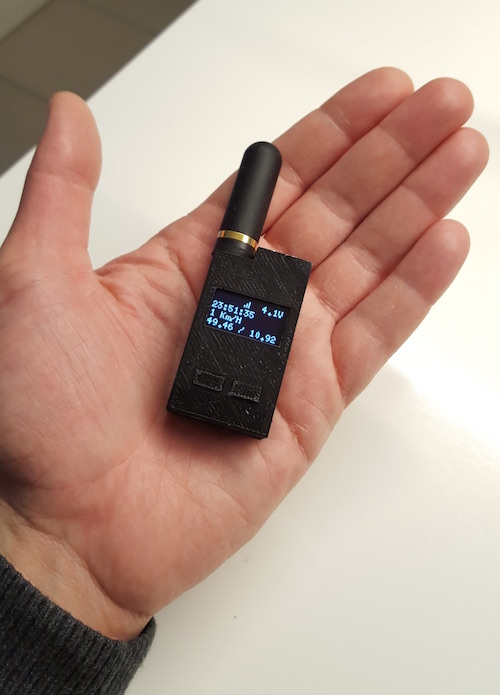 This is perfect to carry the Mini APRS Transceiver with you all thetime, whether on a hiking trip, on a journey with your bike or boat or even when skiing. This device was developed by Taner Schenker (DB1NTO). Many setting options for worldwide used APRS-IS standard, configuration software for Win XP, 7 or 8 included. The GW-1000 also offers functions to use it as an APRS and weather beacon without a computer, very useful for repeater locations. Supports many major weather stations (Peet and others). Extensions for telemetry data are planned, an optional LC display shows status and current messages. Power supply 9-15VDC, max. 800mA. With the optional Bluetooth interface the GW-1000 is becoming the KISS-TNC. Simply use the tablet or smartphone packet or APRS! DSP Packet Decoding - Using software DSP, the TinyTrak4 can not only decode 1200 baud packet, but also 9600 baud, and 300 baud packet, DTMF, and more. Since the decoding is not hardware based, new demodulation capabilities can be added to existing TinyTrak4s. Field Upgradeability - New firmware can be downloaded for free from the TinyTrak4 website and sent to the TinyTrak4 with a computer serial port and a F-F null modem adapter. Analog & Digital Telemetry - TinyTrak4 can read temperature, battery voltage, and other analog and digital sources. More powerful processor - TinyTrak4 has more processor speed, code space, RAM, and EEPROM than the TinyTrak3 to allow for more features. We supply the TT-4 as SMT vrsion, fully asse,bled and operational, with box. The installed software has equal functions like the TT-3. GPS Beacon: In combination with a GPS receiver any handheld or mobile radio can broadcast the GPS information. The beacon features a serial interface which allows PC-programming of the call sign, TX delay, beacon intervals and beacon text. 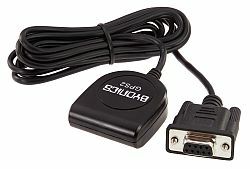 During operation the GPS receiver is connects to the serial port and the audio as well as PTT terminals connect to the radio. Imagine a moving fox hunt with such a relative simple set-up. The analysis of the received data is not possible with TinyTrack. TinyTrak3 is a GPS position encoder which, when connected to a GPS and a radio, will transmit its location at an adjustable rate. 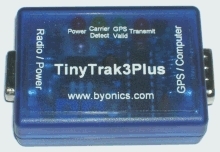 TinyTrak3 is a construction project providing an inexpensive way to build a mobile tracker without the need for a full TNC. 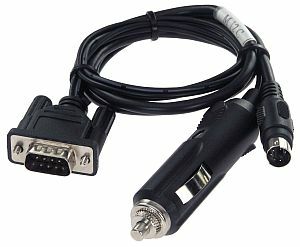 It is configured by connecting to a computer's serial port, and running a simple configuration tool which allows setting of all user options. TinyTrak3Plus is a redesigned TinyTrak3 with a larger voltage regulator that can power a 5V GPS, such as a Garmin GPS18. TinyTrak3Plus has the same features, and uses the same firmware chip, configuration software, and case as the TinyTrak3, but a separate documentation file is available with instructions for the different PCB. TinyTrak3Plus is sold with a case.